Pastor Dawna has been married to Pastor Eddie Elguera, for the past 34 years. Raised in Lake Arrowhead, California, she has been a part of The Rock Church family since it began in 1988. During her time on staff, as one of the senior associate pastors, her responsibilities included being the youth pastor with her husband, women's ministry administrator, and School of Ministry instructor. Over the past two decades, Pastor Dawna and her family have traveled throughout North America, Central and South America, Europe, Australia and Asia through various missions and ministry opportunities. 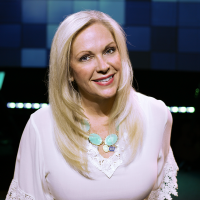 In 2006, she and her husband were launched into the adventure of co-pastoring and leading The Rock Church in the Palm Springs area. She loves the full life God has entrusted to her and enjoys navigating the adventure of marriage, motherhood, being a grandmother, ministry and the momentum that Kingdom life presents. Her strong leadership gift and her commitment to excellence fuel her commitment to teaching the Word of God with a lively, inspiring and practical approach, so that all who hear would be motivated to expand their capacity to reach their God-given potential in Christ. Join people from all over the world who have connected with Dawna through her inspiring and fun Twitter, Facebook, and Instagram interactions. You can also enjoy getting to know her by reading her latest book Balancing Life in Stilettos, available on Amazon.